Raising a puppy can be fun and very rewarding - and also a big challenge! The K-9 Obedience Club offers several Puppy classes to help you help your puppy become a self-confident, happy and easy-to-live-with companion. For information on class descriptions, see below. For more information and to sign up for a class, check the Calendar of Events. Do not underestimate what your puppy can do and learn, even at a very young age. Suitable for puppies from 3-6 months of age that have had two sets of immunization shots (8 & 10 weeks.) First class, orientation, is held without the puppy and is mandatory for all students. Puppies will be taught basic obedience cues of Come, Sit, Down, Stay, Walk on a Leash, Drop It, Off, Leave It, Greeting People, and Walking through Doorways politely. We use positive reinforcement methods and games to make training fun for both the owner and the puppy. Tips and guidance for impulse control, potty and crate training, plus lots of discussions about many common behavioral issues such as biting, teething, chewing, jumping, barking, socialization, separation anxiety and more. The subject of safety issues for kids & dog interactions will include the various stress signals dogs use daily. We work on the 20 AKC S.T.A.R Puppy test requirements, similar to the Canine Good Citizen (CGC) as many students wish to earn this award that can indicate the dog has great social manners. Both purebred and mixed breed pups can earn this award. The STAR test is given at graduation. 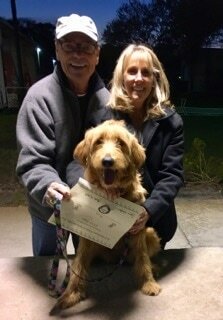 Anita Tomm with her mini Goldendoodle, "Posey" performing the emergency recall taught in our STAR Puppy course.